Sun Yat-sen (1866 – 1925) was a Chinese revolutionary and politician. During the Late Qing era he fought to overthrow the Manchu Dynasty and establish a new, modern Chinese state. His political doctrines, most notably the Three Principles of the People, had a deep impact on the development of China in the 20th century. Sun Yat-sen is the founding father of the Republic of China (ROC) and the founder of the Guomindang (中國國民黨, literally “China National People’s Party”), the oldest still active political party in the Chinese-speaking world. His legacy is still alive both in the People’s Republic of China (PRC) and the ROC in Taiwan. Sun’s doctrines are enshrined in the ROC Constitution. Article 1 states that “The Republic of China, founded on the Three Principles of the People, shall be a democratic republic of the people, by the people, and for the people“. In the PRC, however, the Communist Party of China (CCP) and the Revolutionary Committee of the Chinese Guomindang (RCCGD) both claim to represent the true spirit of Sun’s ideas. In the West Sun Yat-sen’s popularity has been overshadowed by Communist politicians such as Mao Zedong and Deng Xiaoping. But in the Chinese-speaking world Sun has maintained his reputation as one of China’s greatest modern leaders. Museums and mausoleums dedicated to him can be found in mainland China, Taiwan, Hong Kong, Macau and even Singapore (e.g. Sun Yat-sen Mausoleum in Nanjing; Sun Yat-sen Memorial Hall and Sun Yat-sen Memorial House in Taipei; Dr. Sun Yat-sen Museum in Hong Kong; Sun Yat-sen Nanyang Memorial Hall in Singapore). In the present post we shall first sketch a brief biography of Sun Yat-sen, and then we shall provide the full text of a chapter of Sun’s Memoirs of a Chinese Revolutionary (1918), in which Sun himself tells about his life and revolutionary activities until the foundation of the ROC in 1912. The text is a reproduction of the 1953 edition of his memoirs, which is itself a reprint of the 1918 edition. Because of the obscure romanisation of the original text we have provided a pinyin romanisation whenever possible. The names pf persons and places left in their original form are indicated by square brackets. Sun Yat-sen was born on November 12, 1866, in Cuiheng, a small village of China’s Xiangshan County (now named Zhongshan City in his honour). Sun’s father, Sun Dacheng, was a poor peasant who supplemented the family’s meagre income through various menial jobs. His mother, despite her bound feet, was a hard-working peasant. “I am a coolie and the son of a coolie,” said Sun Yat-sen once, stressing his humble origins (Marie-Claire Bergère: Sun Yat-sen, 1998, pp. 23-24). Sun has several names in Chinese, but his most popular one is Sun Zhongshan (孫中山), which was given to him during his stay in Japan by Toten Miyazaki. Sun Yat-sen’s older brother, Sun Mei, left China in 1871 and moved to Hawaii. There he made a fortune and returned to his home village in triumph. He married a girl his parents had chosen for him. At this point, Sun Yat-sen’s parents decided that he should join his brother in Honolulu. There he became acquainted with Western culture, something which clearly distinguished him from late-Qing intellectuals steeped in the Confucian tradition of the Empire. 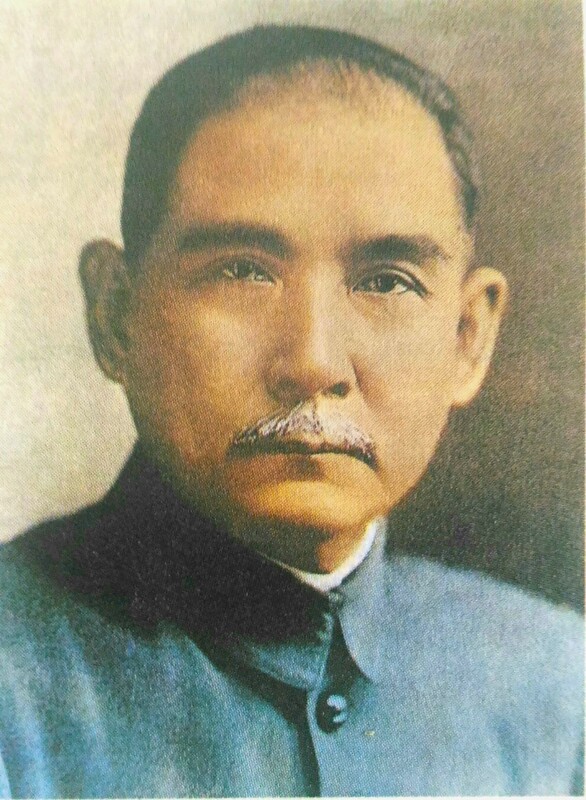 Sun Yat-sen received his school education at Christian schools. He began to reject Chinese religious practices and thought about converting to Christianity. Sun Mei, angered by his brother’s betrayal of his Chinese identity and the worship of traditional Gods, sent him back to China in 1883. But his native village was now too small and backward for Sun. He aroused the ire of his countrymen by attacking traditional Chinese ‘superstitions’ and even vandalising a temple. His family then sent him to Hong Kong, where Sun studied at the Government Central School (later Queen’s College). Both in Hawaii and in Hong Kong the school curricula were mostly in English. In Hong Kong Sun converted to Christianity and was baptised. He, like his brother, married a girl chosen to him by his parents according to custom. In 1887, Sun enrolled in Hong Kong’s College of Medicine and was among its first Chinese graduates in 1892. The contact with Western culture and the awareness of China’s decline influenced him profoundly. China’s debacle against Japan in the 1894-5 war became a turning point in his life. He never pursued a medical career, but devoted his whole life to the purpose of saving China and making it strong and powerful. In 1894 he founded the Xingzhonghui (興中會), or Revive China Society on the model of traditional Chinese secret societies and anti-Manchu movements. The motto of the society was: “Expel the Manchus, revive China, establish a unified government” (驅除韃虜，恢復中華，創立合眾政府). After a failed revolutionary attempt Sun went into exile in 1895. He travelled to Japan, the United States and Europe. In London, he was kidnapped and taken to the Chinese Legation. The Qing government wanted to smuggle him back to China and probably execute him. But thanks to the help of an English friend he escaped (Sun Yat-Sen: San Min Chu I: The Three Principles of the People, trans. Frank W. Price, ed. L. T. Chen, 1927, p. xiv). During his exile he formulated the core of his Three Principles of the People. In 1905 Sun formed the Tongmenhui (同盟會 / 同盟会) in Tokyo. After several failed attempts to ignite a revolution, in 1911 the Wuchang Uprising finally succeeded in overthrowing the Qing Dynasty. In 1912, the Republic of China was established, with Sun Yat-sen as its first president. The same year the Tongmenghui merged with other Republican groups and was renamed Guomindang. However, this was only the beginning of a long period of turmoil. The young republic was unable to defend itself against internal and external enemies: Yuan Shikai, the warlords, Western powers and the Japanese Empire. Sun was forced to flee the country, and later returned to organise a military government in Guangdong Province. In 1917 he was proclaimed Generalissimo of the Guangdong military government. He transformed the Guomindang according to Leninist principles and with the help of Soviet advisers. On May 1924 he inaugurated the Whampoa Military Academy, thus completing the process of militarisation of the Guomindang. Before his death in 1925 he launched the Northern Expedition to defeat the warlords and unify the country. In his life-long struggle to establish a Chinese Republic, Sun Yat-sen suffered many defeats and setbacks. In his undaunted determination and charisma lies perhaps the greatness of this man who never ceased to believe that China could modernise and become a democratic, independent and strong state. My appeal for a revolution in China has been successful, and the destructive part of the Revolution, in the shape of the overthrow of the Manchu monarchy, has been achieved; but the constructive part has far from begun. Nevertheless, I do not lose hope in the successful completion of the Chinese Revolution: that is why I have devoted to it all my energies. In the first year of the Republic , when European writers and scholars were writing thousands of articles about the Chinese Revolution, and approaching its facts more from the point of view of morality than of their meaning, I issued the first chapter of my Notes on the Chinese Revolution, in which I set forth very briefly and concisely how, twenty years ago, the possibility of a successful revolution in China was a subject of great discussion. Although I lived at the time in London, I could not name myself as one of the founders of the “Association for the Regeneration of China.” This at the time involved the risk of persecution. Today I restore from memory the contents of that chapter of my reminiscences, supplementing them with the facts of the last 30 years, which formerly I had to omit for conspirative reasons which will be understood. From 1885, i.e. from the time of our defeat in the war with France, I set before myself the object of the overthrow of the Da Qing dynasty and the establishment of a Chinese Republic on its ruins. At the very beginning I selected for my propaganda the college at which I was studying, regarding medical science as the kindly aunt who would bring me out on to the high road of politics.Ten years passed like one day. In the Canton Medical School I made friends with Zheng Shiliang; who had a very large circle of acquaintances amongst widely-traveled people who knew China well. When I began talking of revolution, advocating its ideas, he gladly agreed with me, and declared that he would immediately enter a revolutionary Party if I would agree to lead it. After staying a year in the school at Canton, I learned that an English Medical School with a wider program than that of the Canton School had been opened at Hong Kong. Thereupon, attracted also by the thought that there I should have a wider field for my revolutionary propaganda, I went to Hong Kong to continue my education. For four years I gave up all my time free from studies to the cause of revolutionary propaganda, traveling backwards and forwards between Hong Kong and Xiamen. At that time I had scarcely any supporters, with the exception of three persons living in Hong Kong: Chen Shaobai, Yu Shaoqi, and Yang Helin, and one man at Shanghai, Lu Haodong. The others avoided me, as a rebel, as they would one stricken with plague. Living together with my three friends Chen, Yu and Yang, in Hong Kong, we were constantly discussing the revolution. Our thoughts were fixed on the problems of the Chinese Revolution. We studied chiefly the history of revolutions. When it happened that we came together and did not talk of revolution, we did not feel happy. Thus a few years went by, and we received from our friends the nickname of “the four great and inseparable scoundrels.” For me this was a period of revolutionary disputes and preparation. After finishing school I fixed my attention on two places, Xiamen and Yang Chen, nominally for practice, but in reality to begin revolutionary propaganda. At that time Zheng Shiliang began recruiting members for the Party. Lu Haodong and I set out for the North, for Beijing and Tianjin, in order to study how stable the Da Qing dynasty might be, and thence we left for Wuchang to study the situation there. In 1894 we decided that a suitable moment had arrived, and went to the Philippines to found the “Association for the Regeneration of China,” having the intention of establishing connections with Chinese colonists there and receiving help from them. However, we had not realized that the moment was not yet ripe for revolution; the result of our propaganda in the Philippines was only ten sympathizers, of whom only two brothers, [Ten Yin-Nan] and [Ten Teh-Chang], agreed to make considerable sacrifices for our common cause. This was just at the time when the Imperial armies were suffering one defeat after another. After the loss of Korea, the Monarchy lost the glamour of its power, as before all the Chinese there were clearly revealed the decay and rottenness of the Manchu dynasty. Our Shanghai comrade [Sun Yueh-lo] wrote insisting that we return. I, Ten Yin-Nan and three other comrades returned home for further work, with the intention of organizing a revolt at Canton and seizing it. Our committee was in Hong Kong and our branch at Yang-Chen. There worked at that time in the committee [Ten Yin-Nan], [Yang-Tsui-Yun], [Haun Yun-Shan], Chen Shaobai and others, while in the branch at Yang-Chen there were Lu Haodong, Zheng Shiliang, and some instructors from America, and some generals. I often traveled between Canton and Hong Kong. Our tasks by that time were quite well-defined. Preparations were in full blast. We had accumulated considerable strength, and we could by a single blow have effected a great deal. But just at this time the authorities discovered the arms we had smuggled in (500 revolvers), and one of our worthiest comrades, Lu Haodong, was executed. This was the first sacrifice made by us on the altar of the Chinese revolution. At the same time there were arrested and executed [Tse-Hsi] and [Chu-Gui]. About seventy people were arrested, among them the Canton Admiral [Tsin-Kui-Guan]. The day of September 9, 1895, I consider to be the day of my first revolutionary defeat. Three days after the defeat I was still in Canton, but ten days later I was forced to escape to Hong Kong by byroads, and thence left for Japan with comrades Zheng Shiliang and Chen Shaobai, in-tending to land at Yokohama. I cut off my pigtail and put on European clothes, as the date of my return to China was indeterminate. Then I left for the Philippine islands, Zheng Shiliang returned to China to restore matters to the point reached before our defeat, while Chen Shaobai remained in Japan to study the political situation. I was introduced at that time to the Japanese Sugawora, and later we made the acquaintance of Sonei and Miasaki, with whom we established connections. This was the beginning of friendly relations between the Chinese revolutionaries and the Japanese. Having arrived in the Philippines, I began to gather comrades to strengthen our “Association for the Regeneration of China,” but even old comrades, owing to our defeat, did not conceal their despair, while some simply forswore our ideas. Owing to the absence of the necessary factors for the development of a revolutionary movement, the latter slowed down somewhat. There was no reason why I should stay long in the Philippines, and I decided to leave for America, in order to establish connections with the organization of Chinese emigrants there. The day of my departure was fixed, and I was walking outside the town when I met a carriage, in which I recognized my teacher Cantlie and his wife. I jumped on to the foot-board, to their great surprise and even fear, as they apparently took me for an evilly disposed person. They did not recognize me, as I had considerably altered my appearance. When I said, “I am Sun Yat-Sen,” they burst out laughing and began shaking me by the hand. I asked them how they came there. They explained that they were on their way home, and were spending the day here taking advantage of the boats stopping there. I offered them my services as guide, which they accepted. At the end of the day, I told them that I should shortly be undertaking a trip round the world, and hope to be in London also, on my way to America. With this we parted, after friendly greetings. Amongst the Chinese emigrants in America I found an even more sleepy atmosphere then in the Philippines. I crossed the continent from San Francisco to New York. On my way I stopped at various places for a few days — for ten days at the most — everywhere preaching that to save our mother-country from threatening destruction we must overthrow the Da Qing dynasty, and that the duty of every Chinese citizen was to help to reconstruct China on a new democratic basis. Although I spared no effort in this propaganda, the people to whom it was directed remained apathetic and little responsive to the ideas of the Chinese Revolution. At that time, however, there were fairly widespread amongst the Chinese emigrants the so-called “Hongmen” societies, although by my time they had been reduced to little more than mutual aid clubs. Their history is as follows. The supporters of the Ming dynasty [Overthrown by the Manchu Da Qing dynasty in 1644] raised several rebellions against the Da Qing dynasty, but always suffered defeat at the hands of the Imperial troops, and when, during the rule of Kangxi, the Manchu dynasty reached the height of its strength, all the efforts of the supporters of the Ming dynasty proved to be doomed to failure. Some of them paid for their audacity with their lives, others managed to escape. Seeing the impossibility of overthrowing the Da Qing, they seized then on the idea of nationalism and began preaching it, handing it down from generation to generation. Their main object in organizing the “Hongmen” societies was the overthrow of the Da Qng dynasty and the restoration of the Ming dynasty. The idea of nationalism was for them an auxiliary. They carried on all their affairs in profound secret, avoiding Government officials and hiding also from the Chinese intellectuals, whom they looked upon as the eyes and ears of the Chinese Government. Knowing the psychology of the masses, the “Hongmen” societies spread their nationalist ideas by means of various plays, which had a great effect amongst the people. In the ideas they spread abroad, everything was based on arousing discontent with one’s position and with existing inequality, and preaching the necessity for revenge. Their passwords and watchwords were dirty and vulgar phrases, and Chinese intellectuals avoided them in disgust. Party solidarity, which afforded them help when in trouble, and a certain coordination in their activities, proved very helpful for wanderers and for various Chinese prodigal sons. Their nationalist ideas helped them in their struggle against the hated Da Qing dynasty, and consequently fed their hopes of a restoration of the Ming dynasty. The Chinese people were in constant conflict with the Imperial officials, and never abandoned their opposition to the Qing dynasty. The watchwords: “Down with Qing!” and “Long live Ming!” were near and dear to many Chinese. But the same cannot be said of our overseas emigrants, as they, being abroad in a free country, had no necessity to organize societies of a fighting character. Therefore in America the “Hongmen” societies naturally lost their political color, and became benefit clubs. Many members of the “Hongmen” societies did not rightly understand the meaning and exact aims which their society pursued. When I approached them, during my stay in America, and asked them, why did they want to overthrow the Qing dynasty and restore the Ming dynasty, very many were not able to give me any positive reply. Later, when our comrades had carried on a protracted revolutionary propaganda in America for several years, members of the “Hongmen” societies at last realized they were old nationalist revolutionaries. Although my stay in America was of little importance for the further destinies of the Chinese Revolution, it nevertheless aroused fears and misgivings on the part of the Imperial Government. Therefore on my arrival in London I almost fell into the clutches of the Imperial Embassy, but I was saved from peril by my teacher Cantlie. It was owing to him that I was saved from the great danger which threatened me. After escaping from London, I went to Europe to study the methods of its political administration, and also to make the acquaintance of representatives of the Opposition parties. In Europe I understood that, although the foremost European countries had achieved power and popular government, they could not accord complete happiness to their peoples. Therefore the leading European revolutionaries strive for a social revolution, and I conceived the idea of the simultaneous settlement, by means of the revolution, of the questions of national economy, national independence, and popular freedom. Hence arose my so-called “San Min Zhuyi,” or the idea of democracy based on three principles. The revolution was my principal aim in life, and therefore I hastened to conclude my business in Europe, in order not to lose time dear to the revolution. I left for Japan, considering that there, nearer to China, we could more successfully carry out our revolutionary plans. On my arrival in Japan I was met at Yokohama by two leaders of the Japanese Popular Party. Later on we met in Tokyo like old friends, and discussed all questions affecting China with great frankness. Just at that time the Japanese Popular Party came to power, and Okuma was appointed Minister for Foreign Affairs. I was introduced to him and to other Japanese politicians. This was our first contact with representatives of Japanese ruling circles. Then I met Soezima and other representatives of the Japanese Opposition. Later they all greatly helped the cause of the Chinese Revolution. There were fully ten thousand Chinese emigrants in Japan, but an atmosphere of inertia prevailed amongst them. They were terribly afraid of the idea of revolution, just like the Chinese emigrants in other countries. Our comrades had worked amongst them for some years; yet it turned out that only a hundred odd had joined the revolutionary movement, which did not represent one percent, of our emigrants in Japan. While the propaganda of revolutionary ideas amongst the emigrants was so difficult and thankless, it was even more difficult in China. The Chinese were not repelled by the idea of overthrowing the Manchu dynasty, and willingly entered our Party; but their intelligence was very weak, there was little solidarity amongst them, and they had no convictions. They could be used as a passive force, but under no circumstances could they be an active force. From 1895, i.e. from the moment of our first defeat, until 1900, five years went by, which were a period of great difficulty and suffering for the Chinese revolutionary movement. The revolutionary foundation we had built up in the course of ten years, both in the sense of the work of each of our comrades and in the sense of the positions we had secured, was destroyed. Propaganda abroad also had little success. At this time, too, monarchist organizations grew up and became very active on the political arena. Our hopes were almost destroyed, but our comrades did not fall into despair and courageously looked ahead. I sent Chen Shaobai to Hong Kong to publish a paper there for the spreading of revolutionary ideas, and ordered [Li Kiang-Jo] to proceed to the province of Zhejiang to organize the forces there. I instructed Zheng Shiliang to proceed to Hong Kong to establish an organizing bureau there, and recruit new members for our Party. Very soon there took place the amalgamation of the “Association for the Regeneration of China” with organizations which had sprung up in the Guangdong province and other provincial organizations of the Yangzi valley. At this time also there took place the movement inspired by the Manchu dynasty which was known as the “Boxer Rebellion.” Eight foreign Powers dispatched their troops to China and opened military activities. I decided that this moment ought not to be lost, and instructed Zheng Shiliang to leave for Huzhou, in order to organize a rising there, and dispatched Li Kiang-Jo to Yangchen for the same purpose. While all these preparations were going on very feverishly, I went to Hong Kong with some foreign officers, intending to get across to my native country by water, there to assume personal control over the best forces of the nation, and to organize a disciplined revolutionary army to save China from destruction. But quite unexpectedly for myself I was betrayed by some scoundrel, and the Hong Kong authorities subjected me to a search and would not allow me to land. In this way I was not able to carry out my original plan. Therefore, I placed full responsibility at Hukou on Zheng Shiliang, and sent [Yang-Tsu-Ya], [Yun-Li-Tsi], Chen Shaobai and others to Hong Kong to help him. I returned myself to Japan, whence, I traveled to Formosa [=Taiwan], intending again to think out some means of getting into China. The Governor-General of Formosa was, at that time, Kodama, a man who sympathized a great deal with the Chinese Revolution, as he considered that the North was entirely in the grip of anarchy. He instructed one of his assistants to enter into negotiations with me, promising that if there were a serious outbreak he would support us. I extended our original plan, increasing the number of specialist officers, as at that time our party had too few politically conscious military experts at its disposal. On the other hand, I ordered Zheng Shiliang to alter the original plan of attacking the principal city of the province, and instead to seize the maritime area and concentrate our forces there, and then to begin the attack. Zheng Shiliang immediately left for the appointed place on receipt of my instructions. With for the most part peasant detachments under his command, he attacked the Imperial soldiers at Xinyang and [Shenchuan] and disarmed them, and then attacked [Lungan], [Tanshui- Yunhu], and other points. Everywhere he was successful, with the result that the Imperial troops began to disperse as soon as they came into contact with his advance guards. He then occupied successively the whole maritime area from Xinyang to Huzhou, and there awaited my arrival with our supporters, and also the arrival of arms and military equipment. However, quite unexpectedly for us, ten days after our revolutionary armies opened the attack, there were changes in the Japanese Government, and the new Premier took up an attitude towards China which was quite the opposite of his predecessor’s. He forbade any negotiations between the Governor-General of Formosa and the Chinese revolutionaries, and also prohibited both the export of arms and the entry of Japanese officers into the Chinese Revolutionary Army. This disarranged my whole plan. I sent Yamada and a few more comrades to the camp of Zheng Shiliang, to inform him of what had taken place and to instruct him to act according to the circumstances of the moment. When they arrived at his camp, thirty days had passed since the beginning of operations. An army of 10,000 men had been collected with was impatiently awaiting the arrival of arms and superior officers. When they received Yamada’s information, it was decided immediately to dissolve the troops, and Zheng Shiliang returned to Hong Kong with some hundreds of our comrades. Yamada lost his way, was seized by the Imperial troops, and was executed. This was the first foreigner who sacrificed his life on the altar of the Chinese Revolution. The 1900 affair was the second defeat of the Chinese Revolution. However, after this defeat the attitude of the Chinese people towards us changed greatly. After our first defeat, all looked on us as rioters, robbers, who were doing something unjust. We were overwhelmed with curses and abuse, we were looked upon as poisonous snakes, and people avoided our acquaintance. After the defeat of 1900, although the former voices which cursed us were heard as loudly as ever, there were already many intelligent Chinese who regretted our defeat and expressed to us their sympathy. If this be compared with the past, of course we shall find a vast difference, and our comrades who realized this were greatly delighted in their hearts at these signs of China’s gradual awakening from sleep. The glamour of the power of the Da Qing dynasty was finally dispersed when the troops of the eight Powers entered as conquerors into Beijing, while the representatives of the Imperial House fled, and after an armistice agreed to an indemnity for damages of 100 millions. The material conditions of the Chinese people grew worse and worse, and a terrible peril continued to hang over our Motherland. All intelligent Chinese began to understand that China was on the brink of destruction. From this moment a new revolutionary wave began to grow up. At this time nearly all the provinces began to send students to Japan to receive their education there. Amongst the students who came to Tokyo there turned out to be many people with young and clear heads. They seized on revolutionary ideas at once, and soon entered the revolutionary movement. All the arguments of the students of that day, and all their thoughts, turned around revolutionary questions. At a students’ New Year’s Day meeting [Lu Chen-Yui] made a big speech on a revolution to overthrow the Manchu dynasty. He was expelled from the University at the demand of the Imperial Minister in Tokyo. Other students, such as [Tsi Yuan-Chen], [Chen Cha-Chai], [Chai Bo-Tsuan], published popular newspapers to spread revolutionary ideas. This revolutionary movement amongst the Chinese students found its way into China. At Shanghai the students [Chang Tai-Yang], [Wu Wei-Hoi], [Cho Chang] and others utilized the Christian papers for revolutionary propaganda. Their actions were complained of by representatives of the Imperial authorities, in consequence of which they were arrested and imprisoned on the territory of the foreign concession. One of them, however, managed to escape abroad. Then there followed the only trial of its kind, in which the dynasty brought an action against an individual in the foreign Court, and won its case. Cho Chang was sentenced only to two years’ imprisonment. During this period the popular movement grew stronger and stronger. The emigrants hailed with joy the appearance of Cho Chang’s book, The Revolutionary Army, in which he attacked the Da Qing dynasty very strongly. It played a big part in the revolutionary movement amongst the Chinese emigrants. This period I consider to be the beginning of the epoch of the wide development of the Chinese revolutionary movement. In 1900-1903 the Governor of Annam several times requested the French Consul at Tokyo to invite me to meet him personally, but somehow I could not find the time for this. 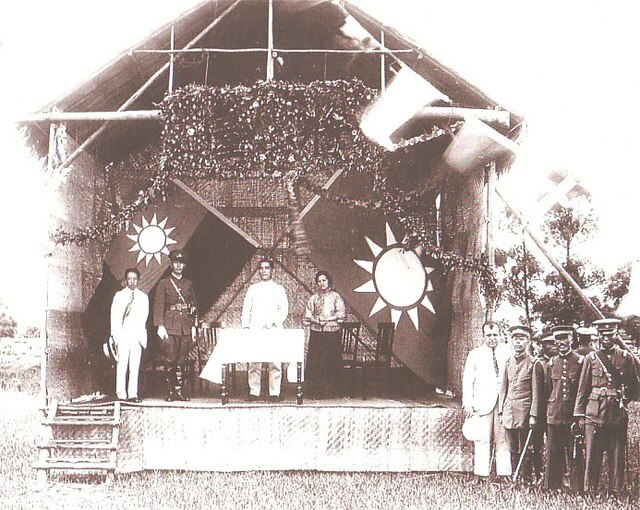 When the Exhibition was opened at Hanoi I went there, but when I arrived in Annam I learned that the Governor had resigned and left for home, instructing his Chief Secretary to receive me well. During my stay at Hanoi I made the acquaintance of [Hua Lun-Chen], [Wang Tsei-Ting], [Wa Bi-Yang] and other comrades: all of them later became our sympathizers, and took a great part in the affair at Kiang Liang. At the end of the Hanoi Exhibition, I again left for a journey round the world through Japan and America. When traveling through Japan I was met by [Lo Chung-Kai], [Fu Fu-Ma] and others, who ex-pressed their full sympathy with the Revolution. I requested them to set up an organization amongst the most intelligent comrades. Later on, when our “United League” was being set up, they brought very many people with them. After the defeat at Huzhou, in the period before the setting up of the “United League” we were joined by [Li Tsi-Tang] and [Hun Tsuan-Fu] at Canton and [Huan Ki-Tsiang] and [Ma Fu-Yi] in the province of Hunan. The revolutionary movement in China was growing much stronger. The emigrants who lived abroad were gradually being inclined to the side of the Revolution by the revolutionary propaganda of the students and the popular movement in China, and during my journey across Japan everywhere expressed their sympathy to me. In the Spring of 1905 I arrived in Europe once again, and the majority of the students there were supporters of the Revolution. They had only just arrived in Europe from Japan or China. The revolutionary wave seized on them, and they soon began to go on from arguments about the Revolution to direct revolutionary activities. I then set forth my long-guarded ideas about democracy embodied in three principles and the “Fivefold Constitution,” in order to create a revolutionary organization on their basis. Our first meeting took place at Brussels, and thirty people entered our League. The second meeting was organized in Berlin, and there twenty odd persons joined. The third meeting was in Paris, where ten people entered the League; but at the fourth meeting in Tokyo several hundred new members joined. There were in our League representatives of all the provinces of China, with the exception of Gansu, as Gansu had not yet sent any students to Japan. At the time our League was being set up the word “revolution” was still terrifying, and therefore our League was simply called the “United League,” which name it retained for fairly long. After the creation of the “United League,” I began to believe that a new era of the Chinese Revolution was opening before us. Previously, I had more than once met with great difficulties, I had been spat upon and ridiculed by all. I more than once suffered defeats, but I audaciously moved forward, although I must confess that I did not dream of the accomplishment of the overthrow of the Manchu dynasty still in my life-time. However, from the Autumn of 1905 onwards, after the creation of the revolutionary “United League,” I became convinced that the great cause of the Chinese Revolution would be accomplished during my lifetime. It was then that I decided to put forward the watchword of a Chinese Republic, and to advocate it before all the members of our Party, in order that when they returned home each to his own province they should widely support the necessity of revolution to set up a Republic. Scarcely a year had passed before 10,000 people joined our “United League.” Branches were organized in almost all of the provinces, and from this time forward the revolutionary movement went ahead with great strides. Its further development exceeded all my anticipations. The foreign governments at that time also began to look upon the Chinese revolutionaries favorably. On one occasion when I was passing through Wusong on my way to Japan, I was visited by a French officer, on the instructions of his superior officers, who informed me that his Government intended to support the Chinese Revolution, and then asked me what was the position as regards the revolutionary forces. I told him the true state of affairs. Then he again asked me how matters stood with the organization of our military forces in the provinces, and our connections with the districts, adding that if all were not well in this respect his Government would immediately give us help. To this I replied that in this respect all had not yet been done, and asked him to send us agents to help us, and also to investigate the position and establish connections. They then sent some officers from their Tianjin staff to be at my disposal. I instructed Lo Chung-Kai to organize an office at Tianjin, instructed [Li Chung-Sha] with some officers to leave for Guangdong and Guangxi to investigate the position, ordered [Hu Yi-Chen] to travel with some officers to the provinces of Sichuan and Yunnan and also to investigate the local position, and finally ordered [Kiao Yi-Chai] to travel with some officers to Nanjing and Wuhan for the same purpose. At that time there were freshly mobilized troops at Nanjing and Wuhan, and they welcomed our comrades on their arrival. At Nanjing preliminary negotiations with them were carried on by a certain comrade [Chao Po]. He had conferences and secret meetings with their officers up to the rank of battalion commander. At Wuhan, [Lu Tsia-Yun] carried on negotiations. Together with some of the military comrades, he summoned a general meeting in a church, to which very many people came: it is said that there was even present the Commander of the troops, [Chang Hu]. At this meeting all present made speeches entirely in favor of the revolution, and the French officers also supported this. All this became widely known, and soon after-wards Zhang Zhidong, the Governor-General of the provinces of Hubei and Guangdong, sent a foreigner, who worked in the Customs, to spy on the French officers. By expressing his loyalty to the Chinese Revolution, this spy entered into close relations with the French officers. They accepted him as a European, and told him everything. Zhang Zhidong then sent reports to the Imperial Government at Beijing, informing them of all the plans of the Chinese revolutionaries, both real and invented. The Imperial Government when it received these reports, immediately opened negotiations with the French Embassy on this question. The French Embassy, not being acquainted with all the circumstances, asked its Government what should be done with the officer referred to, to which it received a reply instructing it to hush up the whole affair. The Beijing authorities could do nothing. Some time later, however, the French Government was changed, and the new Cabinet took quite a different view of the question. It recalled this officer and others, and subsequently Lu Tsia-Yun was arrested and executed. From the very foundation of the “United League” we published newspapers which spread far and wide the ideas of the Chinese Revolution, democracy embodied in the three principles and the “Fivefold Constitution.” A wave of revolutionary thought rolled all over China, but it reached its highest point when we began to publish journals. At that time we were joined by famous heroes like [Hsu Si-Lin], [Sun Yaen-Tsi], [Tsu-Tsin] and others. The revolt at [Pinli] began in 1907, and was carried out independently by our “United League” with its own forces, the revolutionary army being organized out of its members. At the time that our revolutionary army was conducting a life-and-death struggle with the Imperial troops at Pinli, all our Tokyo members were yearning to go, and besieged our Committee with requests to send them to the front to take part in the fighting. I know of cases when some comrades who were not able to leave for the front cried like children. Unfortunately, we were not informed in good time about the revolt at Pinli, which was begun by members of our League, and we learned of it so late that we were unable to make adequate preparation. We lost the battle at Pinli and [Lu Tao-Yi], [Nin Tiao-Yi], [Yuan Hun-Yin] and other comrades were captured by the Imperial troops. Part were executed, and part sentenced to imprisonment. This was the first battlechristening of the members of our “United League.” After this it could be said that the revolutionary movement seized on the whole country in unprecedented dimensions. The members of our League in Tokyo, of course, could also not remain passive spectators. Then the Imperial Government proposed to the Japanese Government that we should be expelled from the borders of Japan. I set out from Japan with Hanmin and Jingwei for Annam, in order to organize our office at Hanoi, with a view to a new insurrection. We raised a revolt at Chaochow: however, the troops of [Huan Kan] were defeated there. This was our third defeat. Then followed the revolt of [Min-Tan] at Huzhou, but this also suffered defeat. This was my fourth defeat. In the districts of [Lian] and [Tsian] a rising took place on account of unwillingness to pay taxes. The Imperial Government sent 4,000 of its troops, under the leadership of [Kuo Jen-Chang] and [Chao Po-Siang] to restore order. I ordered [Huang Kai-Tsiang] and [Hu Yi-Chen] to visit their respective camps and persuade them to go over to the side of the revolution. Both generals declared that if a real revolutionary army actually revolted, they would join it. After this we sent organizers to the Lian and Tsien districts to mobilize all the groups of intelligent citizens and coordinate their activity. We also sent [Suan E] and [Chuan Chi] to buy arms in Japan. Moreover, we collected comrades in Annam, and invited many French officers from amongst those demobilised as instructors. We considered that, once we had arms, we would be able to seize the whole maritime area from Fancheng to Dongxing. Dongxing is extremely suitable for the organization of a revolutionary army, as it borders on the French concession, and various kinds of military equipment can be transported with great convenience over the river which separates them. With the arrival of arms we reckoned on equipping and arming 2,000 odd men, then to collect an army of 6,000 men in the Tsien district, and only then to convince Kuo Jen-Chang to come over to our side. In this way we hoped to organize a strong army, which after a short period of training could easily occupy the provinces of Guangdong and Guangxi, and then advance towards the Yangzi and join the lately mobilised troops of Nanjing and Wuhan, which would give us at last sufficient forces for the successful completion of the revolution. expecting to be helped there by the troops of Chao Po-Siang: but the latter, seeing that Kuo Jen-Chang was not moving, also did not dare to move. Thereupon our army, in view of its weakness, decided to retreat to [Shi-Wan-Dashan], which was done. This was our fifth defeat. After our plan of insurrection was defeated in the districts of Tsian and Lian, I personally took the lead of Comrades Huang Kai-Tsiang, Hu Hanmin, some French officers and 100 other comrades, and by a sudden attack seized three forts at [Chen-Nan-Kwang], and took into our ranks the soldiers who surrendered. Here I hoped to collect also the comrades who had retreated to Shi-Wan-Dashan, and by our joint efforts to attack Huzhou. But I did not then reckon with the fact that the comrades at Shi-Wan-Dashan were too far away. We, a group of about 100 men, with the three guns we had captured, fought for seven days against the thousands of men led by [Lu Tsi-Kwang] and [Lu Yin-Tin], and then retreated to Annam. While I was passing through Lianshan, I was recognized by a spy of the Imperial authorities, who approached the French Government, with the result that I was expelled from Hanoi. This was our sixth defeat. After my departure from Hanoi, I gave instructions for all preparations to be made for a new invasion of the Lian and Tsian districts. At the same time I ordered [Huang Min-Tang] to seize Hekou, for the purpose of advancing further into the Province of Yunnan and establishing our base there. Shortly afterwards Huang Kai-Tsiang moved out of Annam with his friends and marched into the districts mentioned, where he fought for several months, bringing panic on the Imperial troops and acquiring thereby great repute. However, after some time he also retreated, owing to lack of military equipment and lack of support. This I consider our seventh defeat. After my arrival in Xinzhou — in about a month — Huang Min-Tang with his 100 comrades seized Hekou, shot the principal officers, won over 1000 soldiers who surrendered, and began to await instructions from our committee. At that time I was in Nanyang, and could not cross French territory to take command personally at the front, and therefore instructed Huang Kai-Tsiang to assume the command himself. Huang Kai-Tsiang was already half-way there, when he unexpectedly fell under the suspicion of the French authorities, and was taken to Hanoi, where, after communication with the Chinese Government, he was forbidden to enter China. The insurgents at Hekou were thus left without a leader, as a result of which we lost the moment suitable for an offensive. Huang Min-Tang held out for over a month, fighting continuously all the time, but the enemy was ten times his numbers and we did not succeed in retaining Hekou. Finally the detachments of Huang Min-Tang, numbering 600 men, withdrew to Annam, which was our eighth defeat. In consequence of the insistence of the Beijing Government, our comrades were expelled from the French possessions and went to Singapore, but were stopped there by the British officials, who would not allow them to land. Then the French Consul in Singapore entered into negotiations with the Governor-General, stating that these were 600 Chinese revolutionaries, who had retreated after their defeat on to French territory, and in consequence of their own wishes had been sent to Singapore. The Governor-General of Singapore replied that he did not recognize Chinese who fought against their own Government as belligerents, and that he considered them to be not political criminals but pure rebels, and therefore they would not be allowed to land. However, after two days’ delay in the port, the French succeeded in carrying their point, and our comrades were permitted to land. During the revolutionary fighting at Hekou the French Government had observed neutrality, but in effect it had even then recognized the revolutionaries as a belligerent side, and therefore it could not treat the comrades sent to Singapore as mutineers pure and simple. After this last defeat, comrade Jingwei was very depressed, and decided to leave for Beijing to carry out terrorist acts: after consulting with me, he left for Beijing with a few comrades; but the attempt he made failed, and he was thrown into prison together with [Huang Fu-Chen]. They were set free only after the Wuhan rising. Up to the creation of our “United League,” there were very few people who helped the revolutionary army in money, and those only from amongst my personal friends. No one else dared to help us. After the creation of our “United League” we began to be helped from outside. Of those who helped us most at that time, I can mention [Chang Tsin-Tsiang], who sold his factory in Paris and gave us a sum of 60 or 70 thousand dollars. Further, amongst the number of the most generous subscribers, I will mention [Huang Tsin-Nan] of Annam, who gave us all his savings, amounting to several thousand dollars. I can also mention several rich merchants of Annam — [Li Cho-Fong], [Tseng Hsi-Chow] and [Ma Pei-Chen] — who subscribed some tens of thousands of dollars. After my repeated defeats, I could not live freely either in Japan, Hong Kong, or Annam, or generally in the districts bordering on China. Thus work within the boundaries of my native country was almost impossible for me. Therefore, entrusting the leadership to comrades Huang Kai-Tsiang and Hu Hanmin, I myself once more set out on a journey round the world, with the special purpose of collecting resources for the Chinese Revolution. Subsequently, comrades Huang Tsiang and Hu Han-Min organized at Hong Kong a “Chief Committee for Southern Affairs,” and, together with comrades Chao Po-Tsiang, [Ni Yang-Chen], [Chu Chi-Sin] and [Chen Chiung-Min], raised a rebel-lion of the newly-mobilized troops in the province of Guangdong. This movement was well thought out, and the banner of insurrection was raised in 1910. Comrade Ni Yan-Tiang went to the camp of the insurgents and assumed leadership of the revolt. From Shahe they moved on the chief city of the province, and had already reached [Han-Chi-Gan], but there met the Government troops, and by an accidental explosion Ni Yang-Tiang was killed. Left without a leader, the rebels dispersed in various directions. This was our ninth defeat. At this time I was leaving America for the East. When I arrived in San Francisco I learned of the revolt. I immediately set sail for the Philippine Islands and Japan with the object of returning to China. 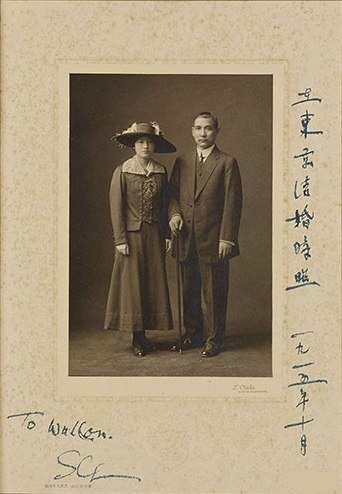 But in Yokohama I was recognized by spies and could not remain there, and left for the South, where I decided to meet Huang Kai-Tsiang and Hu Hanmin to confer on the plan of our further activities. Amongst the comrades at this time there was great depression. After our defeat and the destruction of our strongest committee, we had lost advantageous positions. Most of our fighters were forced to flee and emigrate. We had not sufficient strength to organize all anew. Therefore the comrades were in an extremely pessimistic frame of mind, and when we began to talk of our future plans, they all sighed heavily and did not look one another in the eyes. I then summoned the Chinese emigrants who sympathized with us for a conference, the result of which was that they collected eight thousand dollars for us, and in addition decided to delegate comrades to collect the sum we required in the various regions and provinces. In the space of a few days we collected sixty or seventy thousand dollars. We worked out a plan of action. I went to the Dutch possession, but was not admitted, and was also refused a passage through the British possessions; so that I had nothing else left but once again to leave for Europe or America. I went to America, where I traveled from corner to corner, agitating amongst the Chinese emigrants and urging them to help us and to subscribe money for the cause of the Revolution. On this occasion there were very many sympathizers amongst the emigrants in America. At this time took place the Guangdong rising. All the most heroic revolutionaries took part, and although we once again suffered defeat, the glorious deeds of the seventy-two heroes resounded through-out the world. This was our tenth defeat. Even before the rising, comrades Chen Yin-Shin, [Sun Tun-Chu], [Tan Shi-Bin], [Tsui Tsiao-Shen] and others, seeing that in the province of Guangdong we were suffering one defeat after another decided to transfer the center of their attention to Hankou, Wuchang and Hanyang, i.e. to work amongst the garrisons there, consisting as they did of newly-mobilized soldiers. After some agitation had gone on amongst them, their state of mind was so revolutionary that the Governor-General of the Hubei and Guangdong provinces ordered the most revolutionary units to be transferred to the province of Sichuan. provinces, Rui Zheng, made an agreement with the Consul of a “certain” state that, when the revolutionaries rise in revolt, he must land his troops and bombard the city. The atmosphere in Wuchang was electrical. Comrades Sun-Wu, Liu, and others decided to act and raise a rebellion of the troops. However, quite unexpectedly, our committee was discovered, and thirty people were imprisoned; but Hi Yin-Shan, while in the prison at Wuchang, succeeded in notifying Chen Yin-Shin and giving him warning, so that he should not too fall into the trap. At this time, there fell into the hands of the Imperial authorities a list of our artillerymen and other soldiers who were taking part in the work of the Revolution. With the object of saving these comrades from inevitable destruction, it was necessary to act immediately with great urgency. Therefore, [Sun Bi-Chen] first went into action, followed by [Tsao Tsi-Min] and others. At the head of their detachments they attacked the Governor-General’s office and began bombarding it. Governor Rui Zheng, hearing the noise of the cannonade, immediately fled to Hankou, and appealed to the Consul of a “certain” country to bombard the city. But according to the Treaty of 1900, no country had the right of independent action in China, and therefore a meeting of the Consular body was summoned to discuss the question of whether the city should be bombarded to restore order. It turned out that the Consuls had no definite opinion. They were then addressed by my old acquaintance, the French Consul, who informed the meeting that this rising had taken place on my instructions, and declared that the revolutionaries of the Sun Yat-Sen Party were by no means making a sense-less mutiny, but were fighting for the reconstruction of political authority. Therefore, they cannot be classed with the Boxers, and they should not be interfered with. The senior member of the Consular body at that time was the Russian, and he took up the same position as the French Consul. The other Consuls joined with them, and passed a resolution of non-intervention and maintenance of neutrality. Seeing that the Consul was not acting according to the Agreement, and that he could not be relied upon, Rui Zheng fled to Shanghai. But as soon as the Governor-General fled, [Chang Hu] followed him. In this way the Imperial authorities eliminated themselves. Amongst the revolutionaries, during this time, Sun Wu was wounded, while the Shanghai comrades had not arrived. [Tsa-Tsi-Min], [Chang-Chen] and other members of the “United League” then forced Colonel Li Yuanhong to assume the Governor-Generalship of the Hubei province, and only then was order gradually restored. The object of our Revolution, of course, was not limited to the capture of Wuchang alone. The comrades began to display activity throughout the country. Very rapidly we seized fifteen provinces. Earliest of all Shanghai went over to us, immediately after the fall of Hankou. Chen Yin-Shin was acting there, and immediately after Shanghai he seized Nanjing. Thus the seizure of Wuchang, Hankou and Hanyang gave us the keys to the whole of Central China, while Chen Yin-Shin at Shanghai was also growing in strength. morning, in order to think over the question again with a clear head. I woke up the next morning at 11 o’clock and, being hungry, went out to a restaurant. On my way I bought a newspaper and, arriving at the restaurant, unfolded it; immediately my eyes were met by a telegram about the capture of Wuchang by the revolutionary troops. I thereupon sent a detailed telegram to Huan Kai-Tsiang, in which I explained the reason for my silence. In twenty days I could come to Shanghai and take a personal part in the revolutionary struggle, but for us our diplomatic front was more important even than the military front for the moment. Therefore, I decided to concentrate my efforts on diplomatic affairs, and only after settling this business to return home. The state of affairs at that time was as follows. America had proclaimed in respect of China the principle of the open door and the maintenance of its sovereignty, but in relation to the Revolution America had no definite opinion. However, American public opinion took our side. So far as the French Government and French people were concerned, our Revolution met with sympathy. In England public opinion expressed its sympathy with the Revolution, but the Government was opposed to it. Germany and Russia, at that time, were obviously in favor of support for the Da Qing dynasty, and furthermore, the relations between our revolutionaries and their peoples were insignificant, and consequently we had no possibility of influencing their policy. Therefore, there remained only Japan, which was very close to us, and whose best sons not only expressed their sympathy with us, but had sacrificed their lives in the cause of the Revolution. The policy of the Japanese Government was, however, not quite clear in this question, and judging from previous experience one could suppose that it put up a negative attitude to our Revolution. Thus, on one occasion it expelled me from the country, and on another did not allow me to land in Japan. Beginning with 1900, the Powers had not the right to act independently in China. There were six Powers who at that time took a very intimate part in the affairs of China. Of these, France and America took the side of the Revolution, Germany and Russia were opposed to the Revolution. England had not yet defined her policy, though her people also expressed its sympathy with the Revolution, and, while the Japanese Government was against the Revolution, the Japanese people sympathized with it. Thus, the international situation was a question of life or death for the Chinese Revolution. The most important of all for us, at the moment, was the attitude of England, for we considered that if England took our side Japan would not delay in following her example. Therefore, I decided to leave for England. When going through St. Louis, I read a newspaper statement to the effect that a revolution had broken out at Wuchang on the orders of Sun Yat-Sen, and that in the proposed Republic Sun Yat-Sen would be the President. After this I had to hide from the Press correspondents, as it turned out that rumor was in advance of fact. Accompanied by comrade [Chu Cho-Wen], I continued my long journey to England. On arrival in New York, I received information that the comrades were making an attack on Canton, and I sent a telegram to Governor [Chang Ni-Isi] proposing that he should surrender the city, in order to avoid bloodshed, and ordered the comrades to grant him his life, which was later on carried out. Government has stopped the loans for the dynasty, our Consortium will grant these loans only to a firmly established and officially recognized Government. The Consortium proposes for the present to send a representative with you on your return, and when the official recognition of your Government takes place, it will be possible to open negotiations.” This was all I could do during my stay in England. I then returned home through France, and during my passage through Paris met representatives of the French Opposition parties. I received expressions of sympathy from all, particularly from Premier Clemenceau. Thirty days after my departure from France I arrived at Shanghai. The Peace Conference of South and North was taking place at this time, but the Constitution of the future Republic was not yet determined. Even before my arrival at Shanghai, all the foreign and Chinese newspapers were spreading widely the story that I was returning home with a large sum of money to help the Revolution. When I arrived at Shanghai, both my comrades and the reporters of the Foreign and Chinese newspapers expected this, but I replied that I had not brought with me a farthing: but had brought with me a revolutionary spirit, and that, until the aim of the Revolution had been achieved, there could be no question of peace conferences. Soon after this the deputies from all the provinces of China, assembled in the city of Nanjing, elected me Provisional President of China. In 1912 I assumed office, and ordered the proclamation of the Chinese Republic, the alteration of the lunar calendar, and the declaration of that year as the First Year of the Chinese Republic. Thus thirty years passed as one day, and only after their completion did I achieve my principal aim, the aim of my life — the creation of the Chinese Republic.